"My biggest concern with the tech companies is that they tend to pay taxes nowhere," Scholz told CNBC. The European Union has been debating a continent-wide digital tax that would mainly target the "GAFA" group — that is, Google, Apple, Facebook, and Amazon. Sweden, Finland, Ireland, and Denmark blocked a draft proposal last weekend. Proponents of a GAFA tax have pointed out that a lot of online business, such as advertising, isn't being taxed. That's posing a problem for government budgets as more and more transactions move from physical space to the internet. Major tech companies have also regularly exploited loopholes to minimize their tax payments. Apple, for instance, is known to have funneled billions of dollars in international revenue through Irish subsidiaries, paying little tax in that country or where sales actually took place. A 2016 European Commission ruling found that the Irish government had for years arranged preferential treatment — something illegal under E.U. law. Apple has already paid over $15 billion to comply with that ruling, though both it and the Irish government are working to appeal. France is meanwhile advancing the prospect of a national 3 percent tax on tech firms with global revenues exceeding 750 million euros ($843 million) per year. The U.K. could potentially impose a 2 percent tax on companies generating 500 million pounds ($653 million). 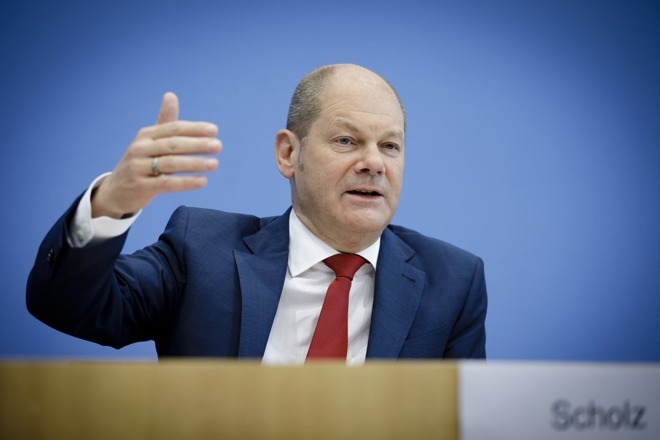 Scholz concurred with E.U. Competition Commissioner Margrethe Vestager, who recently said that a "global solution" to weak digital tax laws was needed. "I think we should find a global agreement on that question, this would help a lot," Scholz commented. The minister suggested in fact that a "common approach" is being taken in the U.S. There are some efforts in the country to secure a minimum tax rate on multinationals that operate in low-tax regions. Apple CEO Tim Cook has famously insisted that "We pay all of the taxes we owe," and moreover that it not only complies with laws but "the spirit of the laws." In February however, Apple agreed to pay the French government about 500 million euros ($571 million) in back taxes following a years-long audit.